When the windmill is not in use a mechanism is required to stop the Sails from turning, as even when the canvas sails are not set a strong breeze can still cause the Sails to turn. This mechanism is found in the Cap of the mill. 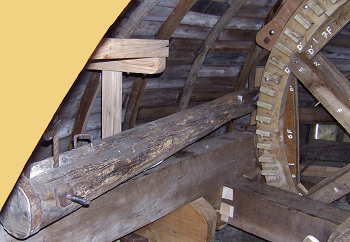 Attached to the Windshaft is a large, almost vertical wheel called the Brake Wheel. Placed around the outside of this wheel is the Brake Band. This consists of a ring of wood surrounded by a metal band. 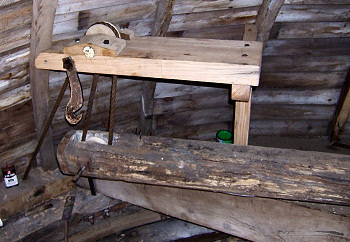 One end of the band is attached to the Mill Cap frame, the other is attached to a large wooden beam (the Brake Lever). The Brake lever is fitted at one end to a pivot so that when the free end is raised it releases tension on the Brake band. When it is allowed to fall the band is constricted around the wheel stopping its motion (in a similar way to a drum brake on a car). This is achieved by the weight of the Brake Lever alone. The Brake lever once set can be held in the off position via the use of a hitch. It can then be applied remotely via a rope that hangs outside down the back of mill and that passed into the mill cap to be attached to the top of the lever via a pulley.